April 4, 2014 — Remembering the dreamer and his Daddy. From my January sermon celebrating MLK’s birthday. I give thanks to my God always for you because of the grace of God that has been given you in Christ Jesus, for in every way you have been enriched in him, in speech and knowledge of every kind just as the testimony of Christ has been strengthened among you so that you are not lacking in any spiritual gift as you wait for the revealing of our Lord Jesus Christ. He will also strengthen you to the end, so that you may be blameless on the day of our Lord Jesus Christ. Paul seems to be indulging in a bit of public relations hyperbole with the church in Corinth. The church members may have been enriched in every way, but they’re not as perfect as Paul makes them seem in the opening paragraph. This weekend, as we commemorate the 85th birthday of our fellow American Baptist, the Rev. Martin Luther King, Jr., these thoughts are worth pondering. Looking back on his ministry, we thank God for Martin’s moral and rhetorical genius. In every way, he was clearly enriched by Christ, in speech and knowledge of every kind, and used his testimony of Christ to give divine authority to the Civil Rights movement. He gave direction and cohesiveness to the campaign to remove legal impediments to justice and to diminish the racism that demeaned the American dream. His intellect, his courage, his eloquence, and his grit combined to make him one of the great figures of the 20th century. It is entirely appropriate that we have engraved his image on postage stamps and carved larger-than-life stone monuments to his memory. But as we celebrate his 85th birthday, let’s also allow ourselves a moment to regret that in making him a cold granite figure, we have lost contact with the warm, passionate, and often imperfect humanity of the man. 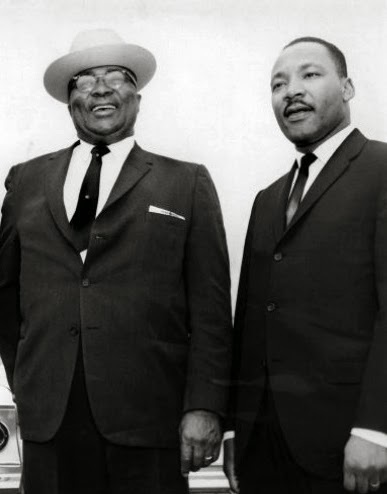 When I started work at the American Baptist Churches offices in Valley Forge, Pa., in 1971, I worked with many people who had known Martin, marched with him, strategized with him, sat on platforms with him, and befriended him. It makes one wonder how many people historians have interviewed when they write their books. The one fact about Martin than I’m sure of, because empty bottles of it are prominently displayed among his personal effects in the MLK museum, is that he liked Aramis cologne. Bill, who grew up in Berean Baptist Church in Brooklyn, knew Martin well and often got tears in his eyes when he talked about him. When Bill served on the national staff of the ABC Ministers and Missionaries Benefit Board (MMBB) in New York, he was often in contact with Martin England, a white MMBB staff member in the ABC of the South. Both Bill and England were concerned that Martin Luther King had no life or health insurance, and they both pressed him to sign up for MMBB benefits. According to Bill, Martin kept putting it off but finally agreed to sign the application form in 1963, five years before his death. Bill’s eyes would overflow when he talked about that. “If he hadn’t, his wife and children would have had nothing,” he’d say. I heard the story often. “I called him Mike,” Bill would say quietly, almost as if no one else was in the room. It was from Bill that I learned that Martin and his father had been named Michael King when they were born, and the elder King changed it to Martin Luther King, in part to satisfy the last request of a dying grandfather. But close friends continued to address the two by their original names. Insiders knew them as Big Mike and Little Mike. This is not a secret, of course, but neither is it widely known. Martin was assassinated in 1968. My kids, all of whom were born after 1976, tended to think of him as a distant historical figure, lost in the archival dust along with Frederick Douglass and Thomas Jefferson. Even before my hair began to thin out and fade to gray, though, the kids suspected I was old enough to have encountered some of these old-time figures. But they figured they had really underestimated my age when they asked if I had known Martin Luther King, Jr.